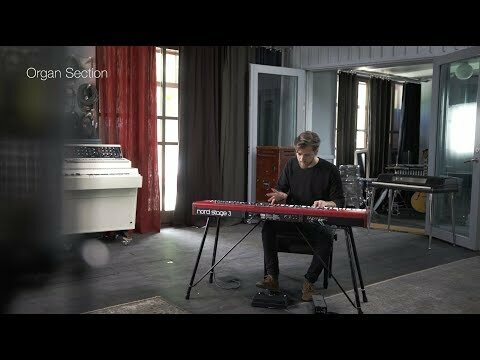 Featuring the best of Nord's award-winning technologies, the Nord Stage 3 digital piano hosts three of the most demanded instrument sections - Organ, Piano and Synth, plus an incredibly versatile and powerful effects section making this one of the best digital stage pianos for professionals today. Ever since 1995, when they released their first synth, Nord have been well known for their high quality sound synthesis, which they have pushed the boundaries of ever since. The Nord Stage 3 features 3 sound sections, each focusing on a particular sound: piano, organ and synth. The piano section of the Nord Stage 3 has been created using the award winning Nord Piano library as a starting point. By using the same cutting-edge sampling technology, every detail within the sampled pianos character has been captured for your use on stage or in the studio. This is then combined with other Nord features including String Resonance, for capturing the resonant reaction of piano strings that aren't being played, Dynamic Pedal Noise (when using the Nord triple pedal - available separately), and the new Long Release function which allows for more fluid legato playing. All of these impressive features are available on a range of grand, upright and electric piano sounds, with more sounds available online at the extensive Nord Piano Library. The dedicated C2D organ section features what many consider to be the most accurate digital recreation of a B3 organ, which has taken three generations of tweaking to get to this point. The incredibly accurate B3 emulation has been created by analysing every aspect of the original, and how it reacts during performance. Alongside the B3 emulation, there are also Vox Continental and Farfisa Compact emulations, as well as a C2 rotary speaker emulation and new principal pipe models. All of this controlled by draw buttons and LED bar graphs. The C2D organ engine is also capable of running 2 organ models at the same time so that you can create some incredibly thick organ tones. Last but not least, the synth engine, derived from the Nord Wave. Analog synthesis, three operator FM synthesis, wavetable synthesis and Nord sample library compatibility are all present, giving you access to a huge range of sounds. The sample capability is a big deal, with mellotron and chamberlin samples as well as the option of loading in your own user-created samples. There's also an arpeggiator, with the option to sync up to the Stage 3 master clock. With the Stage 3, you are able to use two sounds of each Section simultaneously - that's two Organ manuals, two Synths, and two Pianos. These can be combined in any split or layered configuration you wish. The Nord Stage 3 even includes string resonance and Dynamic Pedal Noise adding another dimension to the playing sensation. The Nord Stage 3's user interface is designed from a basic concept: all vital functions are represented on the front panel - easy to access, and never further away than a press of a single button or turn of a dial. With the Stage 3 you only need to focus on your performance, which means never having to struggle with the technology. Nord's patented Pitch Stick and Modulation Wheel are included for maximum musical expression. A top-of-the-line weighted hammer-action keyboard complete with aftertouch, developed by Fatar makes you feel that the Stage's sound is balancing at the tip of your fingers, completely under your control. Nord's efficient Morph Grouping technique is also included, allowing you to assign sound and effects parameters to one physical controller.